White Wizzard is a band based in L.A. that is a part of the whole “retro metal” scene that basically tries to relive the 1980s. Is there anything with that? NO!!! The type of style they played is heavily influenced by the New Wave of British Heavy Metal. This is the band’s first album, though they had a self-titled EP released in 2008 which was later re-released in 2009 as High Speed GTO. With the release High Speed GTO, that’s when myself and many others first began to notice the band. The song “High Speed GTO” was, dare I say it, a high-octane heavy metal song which helped the EP garner some high praise. I didn’t buy the EP though because I was holding out for Over the Top thinking “High Speed GTO” would be included. This is actually the second incarnation of White Wizzard with the band’s founder, Jon Leon, being the sole holdover from the EP sessions. 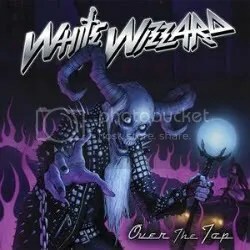 He had fired the original band and then decided to carry on with an all-new White Wizzard after “High Speed GTO” made it’s way onto an Earache metal compilation. Honestly, I much prefer Wyatt “Screaming Demon” Anderson’s vocals over their previous singer anyway (who wasn’t a bad singer at all), so it all works out. The band doesn’t break new ground, this is entirely retro with no attempts to modernize NWOBHM. These guys are fans of Iron Maiden, Judas Priest, NWOBHM in general and it shows. “40 Deuces” and the epic “Iron Goddess of Vengeance” sound like Iron Maiden and the bass heard throughout some of these songs definitely is reminiscent of Iron Maiden’s Steve Harris. This is a very good traditional heavy metal album by a very good and young metal band. Hopefully they can sustain the momentum High Speed GTO started for them and stick around for years to come. There’s a limited edition featuring two covers: Cloven Hoof’s “Gates of Gehenna” and Judas Priest’s “Heading Out to the Highway”. I didn’t realize there was a limited edition until buying this version but I checked out “Heading Out to the Highway” on YouTube and it’s good and faithful to the original.